Numerous studies have reported that women are much more likely to be injured in a rear end collision than are men. Krafft et al1 found that female drivers were three times more likely to be injured than male drivers in car crashes. "[Our] study indicates that men with chronic neck, or chronic neck and back pain, are four times more likely to attribute that pain to an MVA than men with chronic back pain. Women with chronic neck, or chronic neck and back pain, are twice as likely to attribute their injury to an MVA vehicle crash compared with their counterparts with chronic low back pain." Burgess et al3 reported in 1996 that 89% of the patients with TMJ pain after an auto collision were women. In 2007, Carroll et al4 also found that women were much more likely to develop jaw pain after an auto collision than were men. For years, researchers have speculated as to why women are much more likely to suffer from chronic whiplash pain than are men. A new study5 from Washington State University suggests that it's the basic anatomy of the female neck that puts women at risk. The researchers examined 14 men and 14 women matched for height and neck length. The goal was to study the differences between the male and female neck in people with the same height. The authors took x-rays of the necks of all subjects, and then took measurements from the x-rays for vertebral size, posture, and neck geometry. Since the muscles of the neck play an important role in posture and stability, the authors measured the neck strength of the subjects, as well. Because the subjects were matched, there was little difference between men and women in neck length, but there was a large difference between men and women in regard to neck circumference and width. Not surprisingly, the men's necks were about 15% larger than the women's necks. This 15% difference in size, however, translated to a huge difference in neck strength. Men were 31% stronger in flexion than were women. The real dramatic difference, however, came when the researchers studied the x-rays of the subjects. Even though the subjects had the same neck length, nearly all of the dimensions of the female vertebrae were smaller. "In this sample of men and women who were matched by standing height and neck length, we found that women had significantly smaller external neck and vertebral dimensions and lower neck strength than men. We also found that women have more slender necks and less neck cross-sectional area, i.e., muscle, for a given head size. These findings support our hypotheses and demonstrate that male and female necks are not geometrically similar." Whiplash injuries to the cervical spine are caused by shear forces that occur between the vertebrae during a rear end collision. Previous studies have found that being aware of the impending impact is helpful in preventing whiplash injuries. This awareness of the impact allows the occupant of the vehicle to tense the muscles of the neck, providing some support and limiting the shear forces during the crash. It seems from this fact and this current study that neck strength plays a role in the development of whiplash injury. A man with a larger neck and more muscle mass is less likely to experience injurious forces during a crash than is a woman of the same height--even if they're in the same car during the same collision. Krafft M, Kullgren A, Lie A, Tingvall C. The risk of whiplash injury in the rear seat compared to the front seat in rear impacts. Traffic Injury and Prevention 2005;4:136-140. Freeman MD, Croft AC, Rossignol AM, Centeno CJ, Elkins WL. Chronic neck pain and whiplash: a case-control study of the relationship between acute whiplash injuries and chronic neck pain. Pain Research and Management 2006;11(2):79-83. Burgess JA, Kolbinson DA, Lee PT, Epstein JB. Motor vehicle accidents and TMDS: assessing the relationship. Journal of the American Dental Association (JADA) 1996;127:1767-1772. Carroll LJ, Ferrari R, Cassidy JD. Reduced or painful jaw movement after collision-related injuries: a population-based study. JADA 2007;138(1):86-93. Vasavada AN, Danaraj J, Siegmund GP. Head and neck anthropometry, vertebral geometry and neck strength in height-matched men and women. Journal of Biomechanics 2007;In press. 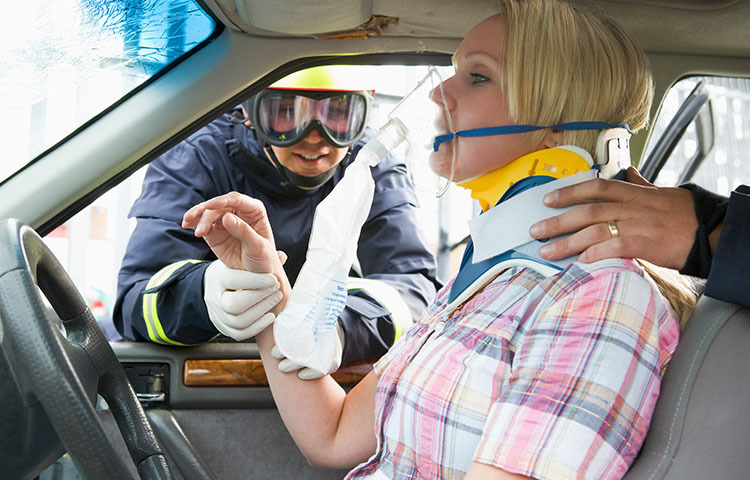 Why Do Women and Men Experience Auto Accidents Differently?